Now here something you do not see everyday. Pre-engineered ground mount solar that exemplifies how innovative ideas can use a proven system and re-smith it in an entirely new way. This is a picture I took traveling to a home job site near Los Angeles. This ground mount solar array is traveling south on highway 99 heading to the customer’s home. Though we were heading for the same destination, we left from different locations and I really did not expect to come across the delivery driver on the way to the job site. This is a great concept that allows any homeowner to have affordable easy power. These ground mount solar systems start with racks made from G-90 galvanized steel, dipped in zinc for extreme durability and synonymous with strength and toughness. SunPods are an innovative modern way of delivering traditional solar systems in an entirely new way. Pre-engineered technology neutral 12 panels system with inverter, wiring, racking, frame & mount system, this creative ground mount solar is a snap to install. Here is how it works. If you have 10′ x 22′ of unshaded yard space, this pre-built system can be lowering your utility bill in no time. Self-ballasted, this solar ground mount system weighs up to 2100 lbs and can be adjusted to accommodate up to 10 degree grade slope. First we take a look at your 12 month kWh history from your utility bill. Then you pick out a space in your yard as close to your breaker box and meter as you can get. Make sure there are no shading issues that will decrease your solar electricity production. We then issue you a detailed analysis of how much you can reasonable expect to lower your monthly utility bill showing you the return on investment (ROI). You then go to Blue Pacific Solar’s website and place your order simply by clicking on the ground mount solar in the left hand navigation and go to the pod we suggest. Our shop built arrays take the hassle out of traditional grid tied ground mount solar by eliminating unexpected field issues such as underground obstacles. Easy to install, we just drop the unit at a predetermine location. You have no weather or site related delays or extra costs. You then simply trench and run your conduit, connect and power up. It does not get much simpler than that. These simple solar systems off more power in less space that range from 2.76kW to 3.84kW (STC-DC rating) per unit. Lower labor costs make these systems economical with a faster return on investment to the consumer. Fast and simple, this ground mount solar array installs fast and simple with less disruption of your yard. Looking closer at the frame, the wiring is enclosed in a trough which also protects the attachment points making the frame of the array tamper resistant. The unique design of this ground mount solar array is also its safety features. The wiring and components are pre-set at a pre-determined tilt and completely enclosed. The frame of the array is field adjustable so it accommodates shifting and settling ground conditions. This ground mount solar array uses extremely durable robust materials make for very low maintenance costs. Frame and inverter is warranted for 10 years, panels have a 25 year warranty. 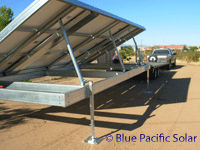 Ground mount solar kits are available for on grid and off-grid applications. They also work great as a mobile energy source for events like burning man or large company outings.